Get the best design, service and installation of custom technology and entertainment solutions in the Glen Allen area. Whether it’s smart home automation for your home, a security system for your business or a completely customized solution, we’ll deliver exactly what you need. Whether you have electronic components that came from us or were purchased elsewhere, we provide repair services so you can keep your systems running without having to pay for major upgrades every time you have an issue. We repair A/V Receivers, intercoms, and central vacuums. Click here to learn more about our repair services. If you’re a contractor or builder in need of a partner on a project, we’ve got you covered. We have years of experience working with partners in the industry and we always welcome the opportunity to help make customers happy. Click here to learn more about partnerships. Contact us now to get started or to ask questions about how we can help you achieve more with your home or business technology and entertainment. Click the link below to get in touch. We specialize in the design, service, and installation of integrated custom technology solutions for residential, commercial clients and contractors. All installations come with a one-year labor warranty and we do repair equipment installed by other companies in most cases. 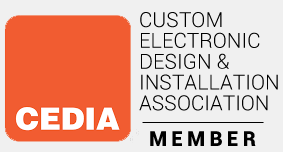 Our expert CEDIA certified senior technicians have over 25 years experience and we are Class A contractors (#2705070935), members of the Better Business Bureau, The National Veterans Owned Business Association (NAVOBA), and the Home Building Association of Richmond. We are committed to making sure that you’re happy with your technology and entertainment solutions in your home or business. If we can answer any questions regarding our company, our services or our products, simply call us at (804) 379-1348 or click the button below.